The hubs says I tricked him into marrying me because I had little Star Wars action figures but didn't actually love, like or even understand Star Wars. LOL! But that's because Legos are so cool! I know I'm not the only one either. However, when you're the only girl in the family, you realize it might be time to actually get into it. So, I paid super close attention when I saw this last one and now, finally after 25 yrs, it's starting to make sense a little and it doesn't hurt that both of our boys names are Finn O. and F. Ray! How inspired was that?! ;) So of course they are going to love that movie when they get to see it. [Warning] While this mom is a very amateur artist (just to give you an idea, the extent of my drawing skills lie in a stick figure Angel Moroni), my 7yr old thought this Star Wars Chewbacca Lunch Bag was cool! I'm sure what you create will be awesome for your Star Wars loving fan! 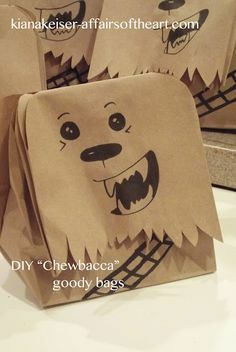 When I saw this lunch bag on Pinterest (unfortunately the website doesn't exist anymore and some other site saved it and it's a heavy ads and promo codes site), you know I had to make one because I thought my boys would love it AND did I tell you my Hubs knows how to sound like Chewbacca! Open the base of the bag and fold it. Cut little triangles of various sizes. Add Lunch items: This bag fit, sandwich + Bag of chips + bag of mini carrots + a fruit strip. Optional: Staple at the top! (My son said he didn't want to rip Chewbacca to open his lunch so he didn't let me staple it. I recommend stapling it just in case you're afraid the food will fall out and get lost!